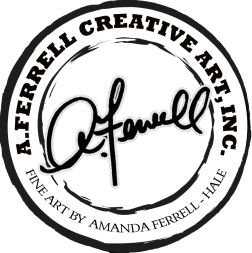 A. Ferrell Creative Art started as a passionate hobby in 2005 by self taught artist Amanda Ferrell. Amanda is a resident of Los Angeles, California, and has been self- marketing her own establishment since July, 2006. Who is today the founding owner of A.Ferrell Creative Art, Inc. an Retail Art Publishing. Throughout her business she shows her astonishing talents in over 60 plus art and hand created pieces, images and products which has now begun her individual signature line of original paintings, drawings, customized, published and manufactured products. As Amanda moves through her productions of A.Ferrell Creative Art, she also shows the world that one artist bold artistic demeanor mixed with a bit of attitude and originality can be the greatest thing when it comes to expression in art. With cool concepts and vibrant colors, it reveals that A. Ferrell is a visual demonstration of where freestyle art collaborates with freestyle fashion design to make authentic quality illustrations and wearable art. A. Ferrell Creative Artproducts and styles are found uniquely maid, affordable and well favored, attracting fans with an exceptionable stylish standpoint from all genres of public, young to old, ages 0 to 99. Many of her mediums used are consistent of sketch/color pencils, pastels, permanent or metallic oil markers, watercolors, acrylics, fabric paints, enamels, designer gems, go-green recyclable materials, i.e. canvas, denim, etc. Or any medium that works for her in creating. Many of her inspirations come from dreams, day visuals, freehand creativity, personal or impersonal situations, photos, readings, fashion, style, expressions, emotions, characters, and/or other inspiring artists. Today Amanda works from home and has made amazing progress throughout her online presence and local community of Los Angeles, CA. You can find her works publicly displayed in several stores around the city. Through A. Ferrell Creative Art Amanda shows that she is truly extraordinary from her competition by standing out like no other by allowing her fans to purchase her products from two (2) different product lines; handcrafts or manufactured. Together custom and/or handcrafted product lines comes with the artist’s personal one-of-a-kind creative touch; nothing is made alike. Often many crafts are kept for keepsakes or made into collectable items or gifts. Manufactured products you’ll find are always affordable and can be purchased through a catalog or website order. Each is uniquely produced with images and clever inspirations, making wonderful greetings/stationary to be used as home décor, or inspirational/motivational gifts for yourself or to pass along to co-workers, friends and family. Amanda finds that she definitely has what it takes to create individual chic and personality. She also has seen a great expansion in her innovative and designer ideals. A.Ferrell Creative Art has many future dreams and aspirations. A few include additional signature products and items such as children's books, handcrafted figurines, indoor and outdoor decor, and so much more. Each day she is working very hard towards the development of A. Ferrell Creative Art in her aspirations to grow and to become a successful business owner with a brand of A.Ferrell Signature line starting with small marketing today, leading to a huge international marketing tomorrow. She continuously incorporates her amazing ideals into her daily visions, dreams and long time goals everyday in hopes of one day owning an amazing gallery featuring her and many other favorable works and collectibles.